Each year, the Intervale Center works with dozens of farms all over Vermont, providing business planning, production assistance, land access help and much more. These farms range from start-up operations to those transitioning their businesses to the next generation. A lot of the farmers we support are in the early stages of business development. Working one-on-one, we help new farmers identify their goals, build their production and management skills, connect with mentors, and acquire other skills that will help them succeed. For instance, in 2015 we worked with Shadow Creek Farm through our Beginning Farmer Program. Here is their story. 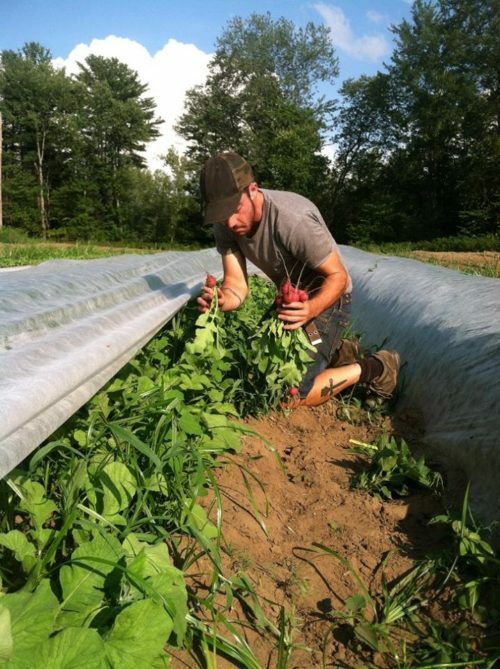 Eli, a beginning farmer, contacted the Intervale Center for business planning assistance in 2014 while he was working full time at Riverberry Farm in Fairfax, VT. Eli wanted to establish a new farm business growing select vegetables for the wholesale market. His initial plan was to grow one acre of salad mix and cut herbs. He wanted to lease land for the first few years, preferably at an existing organic farm where he could also rent machinery. His goal was to launch the business in the spring of 2015 and have it be his full time income by 2018. When we met Eli, he already had written a business plan. He wanted help fine tuning his plan and navigating his way through leasing land, accessing capital through loans, obtaining organic certification, and planning a financially sustainable business. Maggie Donin, our Beginning Farmer Specialist, got right to work with Eli on refining his financials. They also discussed market and crop planning and land access. Maggie hired Mimi Arnstein from Wellspring Farm to assist Eli with production planning as well as market research and marketing. Mimi is an experienced Vermont farmer who is knowledgeable in marketing crops both direct-to-consumer and wholesale. After working with us, Eli was able to start his business in 2015. He rented one acre of land at Riverberry Farm and developed an agreement to use their equipment on his plot. Eli had an up-to-date business plan for the season, a profit and loss statement, a cash flow, and a crop plan. The crops he chose to grow after working with Mimi changed drastically. He went from planning to just grow salad mix and herbs to growing hot peppers, early cucumbers, radishes, and salad mix. With encouragement from Mimi and Maggie, Eli was accepted as a Journey Farmer with NOFA-VT. He also received a loan from The Carrot Project for his first season. Eli will continue to run Shadow Creek Farm in 2016 on leased land at Riverberry Farm and is on his way to establishing a successful farm business. Shadow Creek Farm is just one of the 60 farms we worked with in 2015. Many thanks to Eli for letting us share his story!